Hermetic LED fixture with built-in LED module and driver. 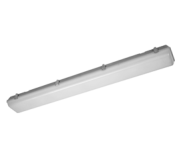 Replacement for standard hermetic fixtures with LED or fluorescent light sources. Standard: Milky cover, body and cover – PC, clips – inox steel, non-dimmable driver, IP 65, IK 10, I protection class. Options: connected power wire, trunking wires, any light and body color.